With the help of the Tales ombudsman, Mr. Bigmouth, the top five funniest Dos Equis "Most interesting man in the world" lines have been chosen. 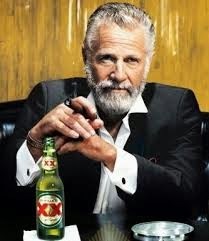 #5 The most interesting man in the word once received a standing ovation....................from the jurors' box. #4 The most interesting man in the world can start a fire ...................by playing the castanets. #3 The most interesting man in the world is so interesting that mosquitoes don't bite him............out of respect. #2 The most interesting man in the world can play Chopin .................on the drums. #1 Mexican jumping beans ask him.....................how high.